How do your customers know that your CS-Cart store offers great experience? The Google Trusted Stores add-on integrates your CS-Cart store with the latest e-commerce service Google Trusted Stores which helps you bring more customers to your store and improve sales. The Google Trusted Stores add-on makes your life easier by automatically adding code to each page of your website in order to display the Google Certified Shops badge. Also, you can specify a custom position of the Google Trusted Stores badge. Below you can see how the badge is shown on the CS-Cart storefront. — Grow your revenue: Google Trusted Stores have increased conversion by up to 9% and average order size by up to 6%. — Increase shopper trust: Shoppers who buy from Google Trusted Stores get purchase protection of up to $1,000 guaranteed by Google. — Improve your advertising: Badge extensions highlight your trusted status across Google, improving click-through and reducing PPC costs. — Eligibility Requirements: Note that Google has multiple eligibility requirements that you must meet in order to become a Google Trusted Store and display the badge with the add-on on your storefront. The add-on is compatible with CS-Cart and Multi-Vendor 4.3.x. We have updated the add-on due to the changes in API. 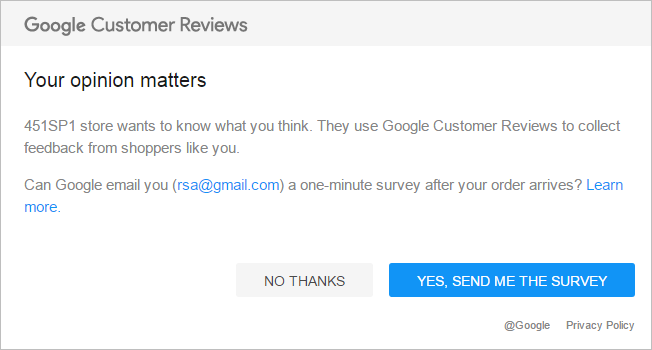 Google Trusted Stores becomes Google Customer Reviews .